Nourish your tresses with Shea Moisture 100% Virgin Coconut Oil Leave-In Conditioner, a leave-in treatment that rehydrates, softens and improves manageability. Infused with 100% Extra Virgin Coconut and Shea Oils, Coconut Milk and Acacia Senegal, the lightweight milk coats hair in a protective and restorative shield to rehydrate and detangle while creating a barrier against heat styling. 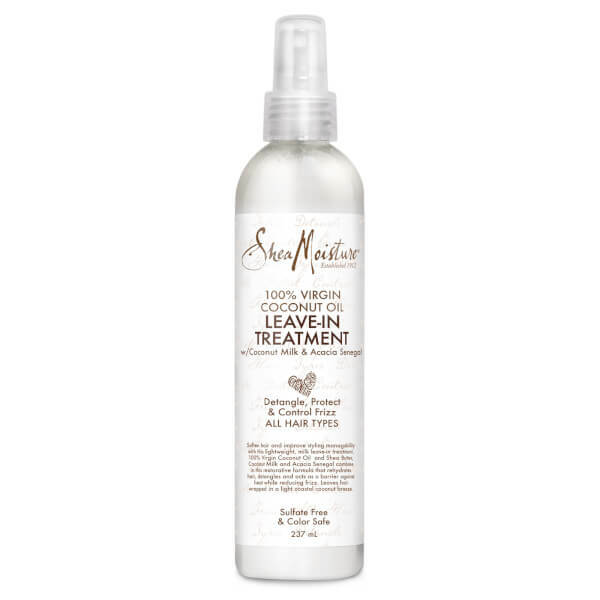 Helping to soften locks and reduce frizz, the sulphate-free and colour-safe treatment will leave hair feeling sleek and nourished. Generously spray on clean, damp hair focusing on mid-lengths to ends of the hair. Blow or air-dry and style as usual. Water, Glyceryl Stearate, Glycerin (Vegetable), Caprylic/Capric Triglyceride, Cocos Nucifera (Coconut) Oil, Glyceryl Caprylate, Cetrimonium Chloride, Butyrospermum Parkii (Shea) Butter*†, Prunus Amygdalus Dulcis (Sweet Almond) Oil, Coconut Acid, Glyceryl Stearate Citrate, Cetearyl Alcohol, Cocos Nucifera (Coconut) Fruit Extract, Algae Extract, Equisetum Arvense (Horsetail) Extract, Argania Spinosa Kernel (Argan) Oil, Rosa Canina Fruit (Rosehip) Oil, Tocopherol, Urtica Dioica (Nettle) Leaf Extract, Acacia Senegal Gum Extract, Hydrolyzed Keratin, Hydrolyzed Vegetable Protein PG-Propyl Silanetriol, Glyceryl Undecylenate, Fragrance (Essential Oil Blend) *Certified Organic Ingredient. †Fair Trade Ingredient. Natural ingredients may vary in color and consistency.